The US Navy is trying to find a better way to detect underwater mines. They used specially trained dophins to remove 100 underwater mines from the Persian Gulf in 2003. 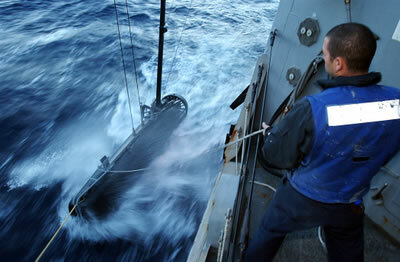 Underwater mine detecting robots have been deployed with limited success. So, the Navy is funding projects that will attempt to use adaptive learning and incremental knowledge assimilation to create a smarter underwater mine detection robot. Sea mines are a cost-effective method for hostile forces to attempt to neutralize assets of the U.S. Navy by limiting mobility and creating delay. Mine detection, classification and localization (DCL) is very challenging in littoral environments due to the high clutter, increased background, and dense multipath. 3 Phoenix, Inc. has developed an innovative approach for automatic target detection and classification of sea mines and other underwater targets of interest. The proposed algorithm robustly adapts to changes in environment and has the potential for dramatically reducing false alarm rate, while still maintaining a high probability of detection and classification. These new systems would extend the capabilities of systems like the Remote Minehunting System, which was tested with mixed results in the field in 2008. It is easy to predict the obvious counter move - smarter underwater mines. It was easy for me, because I'd read Murray Leinster's excellent 1942 short story The Wabbler about just such a device - a robotic undersea munition.